Magnetic reconnection is one of the most efficient processes to convert energy from magnetic fields to particles in space plasmas. It is on-going in many places within the Universe, in the near Earth space, in the space around other planets (Mars, Jupiter,...), in the solar wind and in the solar atmosphere, at other stars, in accretion disks, etc.. One of the spectacular manifestations are solar flares (see picture on right). 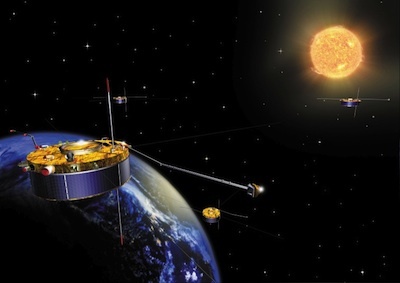 The best laboratory to study reconnection is the near Earth space where we have many satellites with high quality instrumentation. Despite many observations the details on conditions and mechanisms according to which reconnection occurs are still not completely understood. Cluster ESA (European Space Agency) mission is the first multi-spacecraft mission devoted to the study of the Earth magnetosphere. With its four identical satellites flying at adjustable separations, it allows for the first time a 3D study of magnetic reconnection. 2011, Cecilia Norgren, Drift lower hybrid wave properties in space plasma.